Yeah. With WoTLK looming in the foreseeable future and a multitude of MMOs and other distractions over the past few years, Why am I still playing WoW? Do we necessarily want to leave WoW? Also, a run down of how Raiding Alliances work. Okay, just wanted to throw that in based off of the comments I got from a few of you. Copy and Paste method of protection apparently won't help you as they can simply keylog what you copy and pasted from. I'm pretty sure there was a huge trojan attack this past week. As I got far more reports from other people about successful hacks on accounts. Two guesses on how I got hacked. Low security of my password (aka, I used it for multiple applications) or I went to some website that installed a keylogger. I can't be sure of course. Until I can get myself one of those authenticators, I will be taking extra security precautions. I'm paranoid of course, but what else can you do but just do your best to keep you password secure and try to stay in safe sites. Any site that isn't https is an unsecured sight and any information you provide those sites is incredibly easily accessed. Guild forums especially are an easy target if you use the same login.password as your wow account. Again though, nothing is 100% safe so all you can do is do your best to take the most steps to protecting your account. that's what those bloody hackers are looking for....so def. do what you can to make it that much harder for them. Got hacked again while I was at dinner. This time both my accounts got compromised. I had to call Blizzard and speak with someone to get everything changed. Luckily nothing was taken. Except I did notice that all my badges of justice were gone. I'm pretty sure it was from the night before though. Now everything had been stripped from my toons by me except gear and offloaded to multiple accounts and toons of people I trust even some not in the guild. So there's nothing of value in my banks or the guild bank now. There won't be profit in hacking my account but that doesn't mean that they won't try to be malicous and destroy my acccount anyhow. I just heard that the #6 alliance guild on our server's GM account got hacked last night as well. He wasn't lucky like me. EVERYTHING in their guild bank (and it was stacked) was stripped. His character was completely stripped and to make things even more insulting, his toon was transfered to another server. And Blizz said that since it was paid for he is going to have to wait the full 6 mo. duration waiting period to get his toon back on this server. HOLY COW. OMG. can you believe that? I can NOT even comprehend how horrible things could have gone last night if I hadn't be online. 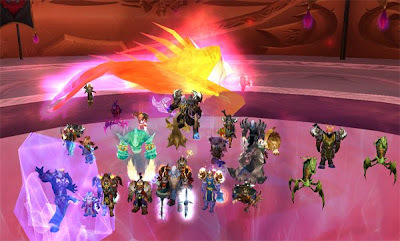 Also as well, the GM of cykos said that in his friend's raiding guild, 6 people got hacked yesterday. We told all of our guild members to change their passwords as well. It is a freaking nightmare. WTF is going on? I am so ubelievalbly paranoid now. I was on my paladin doing the bonfire quests in the outlands when I see my druid log in on my other account. I was having DC issues earlier. I should have changed my password the second time I got dc'd in the raid. Stupid. In any case, I flip out. I'm like OMG! I'm being hacked before my eyes. So my first instinct is to log my character to get them off my account but I bypass that instinct and go straight to the wow website and change my information. So I write a GM ticket on my paladin's account screaming HELP!! I'm being hacked basically. lol. stupid again. I'm so flustered at this point. I scream in guild chat, GET OFF MY F* ACCOUNT!!! I try logging in the new info again and it kicks the hacker out. I get on my priest and see nothing is taken from her bags and all my money is there. Then I go to the guild bank... oh my god. All the primals taken, all void crystals taken, all vortex's taken, and 1000g gone! I wrote a GM ticket again asking if they could find out where it was all sent. Panicked, I log my other characters on this account because I saw he/she accessed two of my other toons. I get on my druid.....SIGH OF RELIEF. It had all been withdrawn on my druid and I must have gotten back to my account before they could offload it somewhere....even the money. JEEBUS H CHRIST. That was so jacked up. I'm still reeling. Thank god I was still on. I was going to head to bed early today but moped around wow instead. Of course, now I have to reformat and re-install EVERYTHING on this computer. SHOOT ME. I have no idea how I got hacked. There are so many sites out there now and applications we run... there's just no telling at all. So yesterday, a friend wanted to get points on his 2k rated warrior before the season reset. His computer had been out for awhile. So he asked me if my druid wanted to do games for points. I was like, no way, my druid is in all PvE gear, no resilience, only 8k HP...plus she's spec'd pure pve (0/0/61). so I was like...wtf.. fine with me. I ran in there, threw hots on the warrior and cheetah formed away from the lock and his pet. 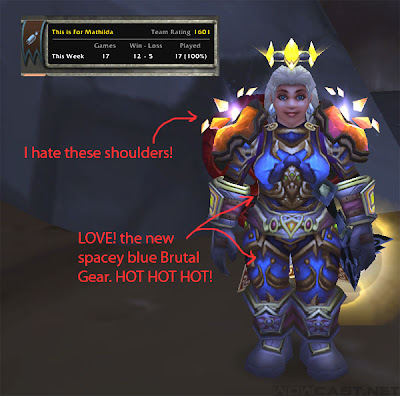 When the warrior got the lock down a bit, I cyloned the pally. And we repeated this over and over again. The game took like 10 minutes. I think because I was in full PvE gear, my mana regen was really high. So eventually, we ran the pally OOM. Game Over. Was fun as hell. But ended up doing 3v3s to get him points that night since 2v2 ques were so long and warrior/druid 2v2 fights take a long time. It's all about wearing down the opponent. I might try out druid more this season. It's a hell of a lot more fun than holy pally for sure....but that might be because I've been doing it for a year...need some change. The Fire Festival this year is really fun because not only do you get gold for doing all of the quests, the rewards are pretty rad too. Dancing draenei and flaming dresses! As soon as I saw the [Brazier of Dancing Flames], I was like ME WANTS! That fiery dancing draeni looks so seductive and beautiful. Unfortunately she costs 350 Burning Blossoms. So today I took off around Azeroth to try and collect as many of the Blossoms as I could. I think I made it to like 16 or so of the sites on the map. I have 168 so far. The real beauty is that for the horde cities, you get double the Blossoms plus double the gold. So anywhere between 6 to 12g per city. They say if you do all of the cities, you can make like 550g for the alliance. 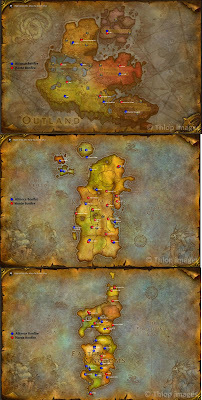 Again, nice festival chain that has everyone taking a tour of Azeroth again. I honestly never thought I'd see Stonetalon Mountains again. lol! Yesterday as a busy raid day. We downed Rage Winterchill and Anetheron in Mt. Hyjal, then finished Hydross and Lurker which we left from Tuesday (since most people don't need anything from them anymore). Then we attempted Al'ar the Phoenix God in Tempest Keep for the first time. It was a really fun fight. We downed the Phoenix on the second try. Not only is the actual fight pretty fun and unique, but the boss itself is gorgeous. You don't get to see as pretty a boss mob in many of the instances. I will say that at first, I had real reservations about the cykos/jae alliance simply because almost all of my best laid plans tend to tank on me. Not to mention the wall of drama we had to hurdle to get it under way....But surprisingly, the synergy between the two guilds is good although there are personality differences of course. Still, if it weren't for this joint venture, I wouldn't have been able to see the instances or experience any of these fights. My favorite so far is Mt. Hyjal. I love the encounter of a barrage of 8 waves of mobs and then the boss. It makes the battle so much more epic. Of course, most people tend to hate the encounter because if you fail, you just lost about 30 mins of your time. heh. I was heading to Nagrand to do two of my daily quests when I spot this level 63 rogue down to 25% health killing Clefthoofs, the low level ones. I drop down and heal him up. I notice he's not skinning the animals so I assume he's just killing them for the quest. So I start up behind and skin and heal him as he goes. So about after the 10th kill, I have 4 knothide leathers, 10 knothide scraps, and 1 clefthoof leather. You don't get much from killing the regular clefthoofs. So then he whispers to me, "let's split the prophet 50/50"
I immediately stop healing him and take off flying to finish the rest of my quests. Is he serious? Split my 4 knothide leathers? WTF? I'm basically heal botting him and skinning crappy meat. Man....it explains so much when I do pugs.. wow. So yeah, last arena episode I think I got a little misunderstood because of my negativity toward welfare epics. I think my point came out a little wrong. It wasn't intended to sound like I was some elitist prick. So to make it up, I thought I'd throw up a pure Arena guideline episode...seeing how Season 4 is pending in a week. Hope you enjoy! Rogue shiv <3 this macro! So I'm now sitting on the highest dkp slot in our raid. And the most bizzare thing is that I'm not DKP hording at all. In fact, I've told all of the jae participants of the joint venture NOT to DKP horde. As hopeful as I am that this jae/cykos adventure will last, the truth is, you never know the reality of any situation until it collapses from underneath you. I looked at the loot table ahead and I don't forsee anything I want until maybe the end of Mt. Hyjal or Black Temple, maybe. Most of my loot is badge of justice loot I got from the vendor in the Isle of Quel'Danas. Thankfully, the gear is just as good as most of the loot in the end game content. At first, it feels strange not wanting anything from the instances, kind of like everyone else around me is looking forward to things in terms of loot. However, I'm not. Yet, it is amazingly nice to not have to worry about loot at all. All I worry about is my performance and making sure the raid succeeds. Then, I can just enjoy the content. I rather much like it actually this way. I'm actually thinking about spending dkp in Mt. Hyjal this week if the [Pillar of Ferocity] drops of Anatheron, second boss. We downed him last week and the awesome tanking sword fell. I know I'll never be a feral druid but that staff is one of the most gorgeous things I've seen in the game in such a long time. I admire it on people in Shattrath all the time. Why not spend a few dkp to possess it just for beauty sake. :) Why can't they make healing itmes more ornate? Why a freaking feral druid? You never even see their armor or weapons. What a waste! I do like this system where casual players don't have to worry about getting caught up in the DKP nonsense in order to even make it into the 25 mans. 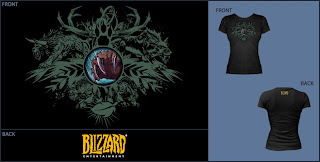 Just get yourself in heroics and kara and you can be sporting hyjal/bt quality gear in no time. Of course, that's all coming to an end with the expansion...but who cares. See as much as content as you can now before it becomes obsolete and no one wants to go back...thats what I say. WoW. I was digging through old data files on my computer and found my character sheet for the role playing game Shadowrunner. Geekatude Maximus! Eilers, a female elf, was born to two human parents who accepted her for who she was and tried to protect her from the prejudices of other humans. It was painful growing up as an elf in an all human public school in the UCAS. When she graduated high school, she made it clear to her parents that she was pursuing college education in the Elven Country of Tir Tairngire. Her parents understood and supported her decision but warned her that she could not escape prejudice no matter what country she ran to. After graduating from the Ehrich Mesa University with a double degree in biotechnology and medicine, she began working for a scientific research lab. Not long after working there, she met an astute elf named Eiland, who was working in the experimental department of the research lab. His parents disapproved of their courtship because of Eilers upbringing with humans. However, Eiland disobeyed and was disowned from his heritage. Half a decade later, they were married in a small ceremony back in UCAS in Eiler’s home. Several years later, they had a baby female elf who they named Adelphia. They brought her up in Tir Tairngire pushing her towards the academics hoping she would one day join them in their field of research. Her parents never spoke of their work because it was a Class A security project. During her adolescence, her parents became driven and obsessed with their work and sent Adelphia off to boarding schools. She excelled in the arts of language, politics, and technology. While at the Egan Boarding School she met Melba, a spunky elf, who soon befriended her. They became the best of friends throughout boarding school and college. They both majored in World Politics and Computer Technology and dreamt of a better world for all races. It was foolish dream, of course. Soon after Adelphia had started her first job working, a sub company for the same research lab her parents worked for, Melba became less and less available. She would only see her friend off and on for years at a time but they still contacted each other through telecommunication. Melba began telling Adelphia about an affair she was having with a man working in a megacorporation called Global Technologies, Inc in the Seattle Area. For about a year, Melba raved on about this man and his company. Then one day on the eve of winter, she was brutally murdered for no apparent reason. Adelphia was distraught. She had lost her best friend and had a very strong feeling that the man she was seeing had something to do with it. She had flown up to the Seattle area several times to visit her friend and remembered a few of her acquaintances. Adelphia spent several months in Seattle going through Melba’s things (her place had been trashed and robbed). She would find small leads from her friends but nothing ever turned up. She became so obsessed and determined to find Melba’s murderers that she had to quit her job at the lab much to her parents’ dismay. They were worried for her safety and begged her to come back to Tir Taingire. Adelphia insisted on staying and eventually moved her things to Seattle and found a part time job. One day as she was coming home, she decided to stop by the taco vender to grab something to eat. She ordered two mega tacos and a bottle of Seattle Water. When she got home, she dropped her things on the floor, turned on her favorite movie, and took a bite of her taco. To her surprise, there was a snapping sound. She had just cracked through a chip of some sort. She quickly checked the other taco and found the same chip. She inserted it into her computer and a document appeared reading “64th and Monterrey at 9pm.” She checked her watch. It was 6:27pm. Two and a half hours later, she was standing at the corner of 64th and Monterrey holding a holey umbrella in the rain. Soon, a man approached her. He didn’t give her his name but directed her to a car where they drove for what seemed to be ages. During the drive, the man told her about Melba’s “accident.” Apparently, she had been involved in a mission to retrieve data from Global Technologies Inc. using the man she had told her she was “involved with.” She had seriously under-estimated the corporations scrutiny of all of its employees and was discovered. Her fate was terminated that very weekend. The man said he knew of her desire to exact revenge on those responsible for Melba’s death. He promised to help her for some fees of course and told her that from then on, she should call him by the name of Soleus. She made her first hit when she killed Melba’s lover and from then on she was a Shadowrunner giving up her identity as Adelphi. She soon found herself in the underworld learning from un-named associates the ways of a shadowrunner. Two years later, she had cyberware installed in her body and began extensive training missions. A decade later, she stole highly classified data by hacking into the Global Technologies, Inc. and was almost terminated. She decided that her debt was paid. Unable to return to her normal life, she remained in the underworld receiving jobs through her contact Soleus and later Mazro. Adelphia met Mazro through an obscure job she was doing on the east side of town. He owned a small Art and B-title movies shop. They were able to conduct contact through his Art and movies. Adelphia now goes by the name of “Phi” in the underworld where she lives in a small apartment with hundreds of paintings, tacos, and b-title movies. She can never go back. Finally bought my next class tee since it's the class I'm currently raiding with. I still love my paladin of course but the versatility of the druid and the support healing is just way too good. I love bringing in the rolling HOTs. I can't stress how awesome they are for raiding. 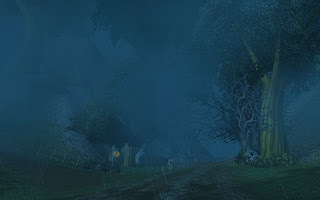 Was on my way to Karazhan when it started raining really hard in Duskwood. It was very nice. I haven't seen rain in a long time in the game. It sprinkled a little last month in Zanger but when you're in Shat or instances all the time, you miss out on the world environmental effects. It's simple things like this that make the game so immersing. From the creator of Jimmy, Pepitoz! "you buy cat, 50 msk!" All the tiny flaws start to really show after 4 years. 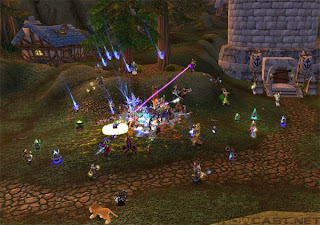 WoW's general idea of creating a general game for the general masses.....well...after we've stuck by this game for this long, it's frankly too general. What do I mean by this? Well, it doesn't leave much in terms of devotion to your character or the game mechanics. Frankly, they're down right boring. For those of us gamers who got the game after the first year, it seems like we're relegated to just going through the motions of the same stuff with new skin...year after year. Don't get me wrong. The game is beautiful and the simplicity is part of it's beauty. That's why it appeals to the masses. But how much longer are we all going to flip the record over and play the same damn song again? I don't play the game because I think it's intriguing from a mechanical stand point. I play the game because it's the best damn social networking site out there...period. Okay. another level grind for a minimum of 3 of my characters. Another round of drama as to who groups up with who and who gets in what raids and who doesn't. And yet another expansion where there are less and less healers in the game. And another round of re-gearing, leveling up professions, and rep grinding. More of the same but with a new dress on. I mean as long as I get to play with my friends, I'll probably keep pushing it. And of course I want to see the new content. Just from getting to test at Blizzcon, the new area is very cool. I just don't think beyond the terrain, we're gonna see anything new to our game play. I hope they prove me wrong. I wanted to see this movie but it's not playing anywhere near here or so Fandango says. damn these documentaries and their limited showings. How can you beat it! "I eat your mind one... I eat your mind two...I eat your mind three"
LOL. Finally a movie about the sub-sub gaming culture of LARPing. Now I just gotta find how to see the darn thing.